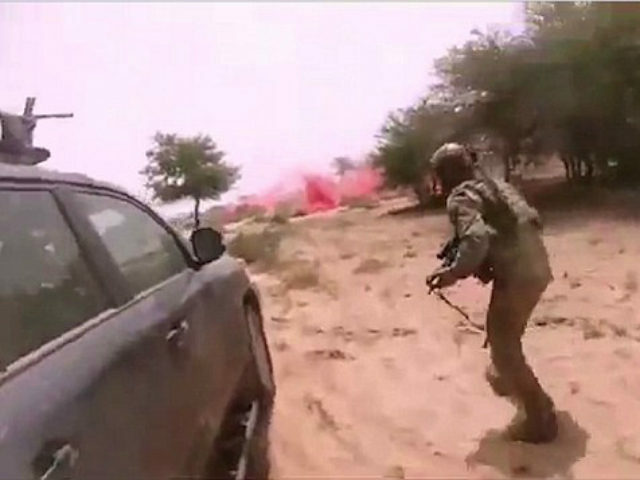 Islamic State (ISIS/ISIL)-affiliated terrorists are disseminating a propaganda video online purporting to show a deadly ambush in Niger in which jihadists killed four U.S. soldiers and wounded two others last October. The video reportedly includes footage allegedly filmed by one of the soldiers’ helmet cameras, showing three U.S. troops on the run from the terrorists, having few resources to retaliate against dozens of jihadists using machine guns and grenades. Pentagon officials have acknowledged that the attack took place on October 4, 2017, near the Niger-Mali border, where a team of a dozen American troops had been sent on a mission with local soldiers. Alleged ISIS-linked terrorists ambushed the U.S. soldiers when they stopped at a village for food and water, killing four American and four troops from Niger. Three Americans allegedly filmed by their fellow soldier’s helmet camera are shown clearly outgunned and overpowered. While one U.S. servicemember is driving an unarmed SUV, ducking because the vehicle is taking heavy fire, the other two are walking behind, firing towards the terrorists. When the first American drops, the two other soldiers tried to pull him to safety, eventually fleeing into a scrub area. In time, they are taken down as well. The soldier wearing the helmet camera appears to be hit and falls to the ground. Then, the footage shows the jihadists surrounding him and shooting at point-blank range. ISIS released the video on the encrypted messaging app Telegram and sent it to a Mauritania news outlet over the weekend, the Washington Post reported. The nine-minute footage begins with members of the West Africa-based terrorist group Jamaat Nusrat al-Islam wal-Muslimin (JNIM) pledging loyalty to ISIS leader Abu Bakr al-Baghdadi. U.S. officials, echoing warnings from the American intelligence community, recently cautioned that ISIS is “adapting” to its losses in the Middle East by expanding its operations elsewhere, particularly across various African countries and regions, such as Libya, Tunisia, and Egypt in the north, Somalia in the east, and West Africa. Niger borders Libya in the north as well as Nigeria in the west. Al-Qaeda, an alleged ISIS rival, has also long maintained a presence in Africa, specifically in Niger’s neighboring Mali, Burkina Faso, and Algeria. Soon after the ambush in October 2017, U.S. Gen. Joseph Dunford, the chairman of the Joint Chiefs of Staff, acknowledged that ISIS appeared to be behind the attack. An estimated 800 American troops in Niger are reportedly participating in a train, advise, and assist mission to prepare local forces to combat the terrorists in the area. JNIM was formed from a number of West African jihadist groups in March 2017, and originally had pledged allegiance to al-Qaeda. This alleged switch to IS was reported last month by a number of analysts, but it had not been promoted by IS outlets on social media. “The Pentagon says the video shows the Islamic State’s ‘depravity.’ They are reviewing the incident and are expected to release a thorough report on what happened, and lessons learned,” reported the Post.